I thought I would pop in to share a quick thank you card I made using up a bunch of random pieces left on my desk from other projects. The card started as a monthly challenge for the Paper Crafts club at Craft Warehouse in which we were asked to use a 6x6 sheet of paper from Echo Park's Winter Wishes collections and the little glitter/rhinestone snowflake sticker. I had a discarded Papertrey Ink label that I had made for another project and the larger diecut snowflake (A die-namics die by My Favorite Things). It turned out to be a quick and simple card, perfect for mass producing and mailing out after Christmas. 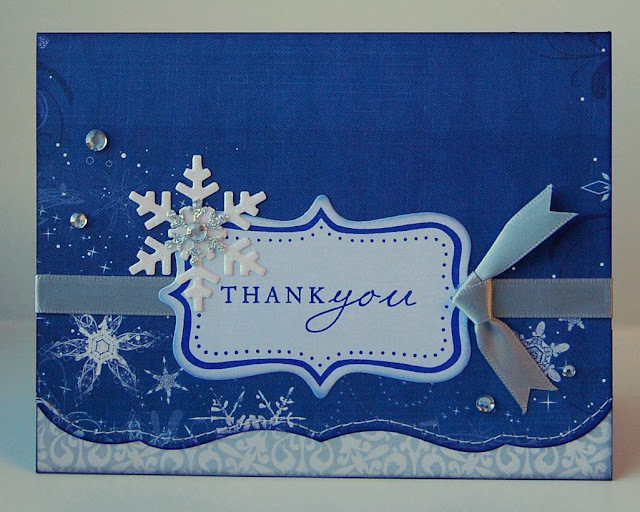 The decorative edger die and thank you sentiment from "Think Big Favorites #19" are also by Papertrey Ink. Very pretty! Love the sparkly accents and the stitching detail! This is such a beautiful card...love that you kept it simple and the little touches of bling.